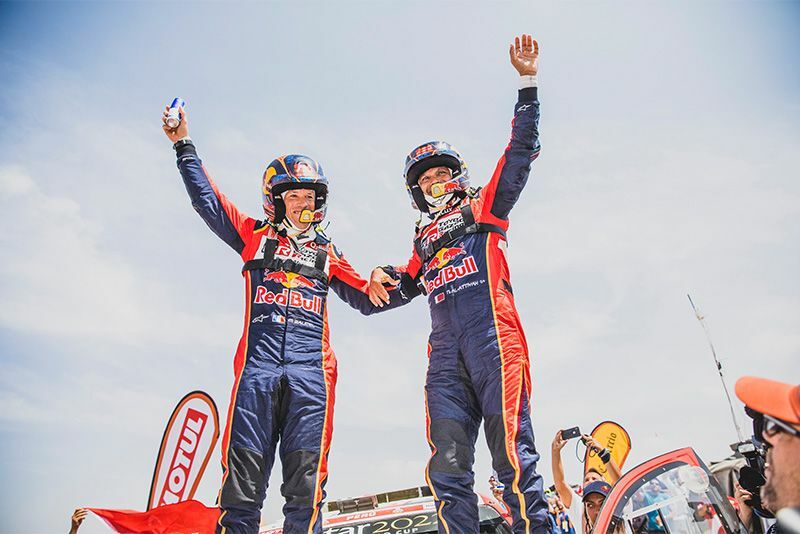 Toyota Gazoo Racing SA’s Nasser Al Attiyah and Mathieu Baumel brought home their South African-built Toyota Hilux in a historic victory as the final stage of Dakar 2019 drew to a close. Historic because it's the first ever win for Toyota as well as the first win for a petrol-powered car since the Dakar moved to South America. On the final stage of the race, Nasser Al Attiyah, from Qatar, and his French navigator, Mathieu Baumel, were shadowed by teammates Giniel de Villiers and Dirk von Zitzewitz – who waited 55 minutes for the leaders to start the stage – so that team Toyota Gazoo Racing SA could finish the race together. Team Principal, Glyn Hall, found himself overwhelmed with emotion as the two teams arrived at the media area after the time control, saying, "This victory was long overdue." An ecstatic Al Attiya said, "We are so happy to win the Dakar – not only for ourselves but also for Toyota and the entire Toyota Gazoo Racing SA team. Everyone has worked so hard for so long, and really deserve this. Thank you for letting us drive this car." Toyota Gazoo Racing SA dominated this year's race as Al Attiyah/Baumel took the first stage and then De Villiers/Von Zitzewitz taking the top spot in stage two. Unfortunately for De Villiers/Von Zitzewitz, a large rock hidden in the dust of Stage 3 saw them lose precious time, putting them out of contention for the win. Al Attiyah/Baumel retook the lead and never looked back. Speaking to the press after the race, Hall said: "When we first heard that the rally was going to take place only in one country, we were sceptical. But the organisers made sure that this year’s race will long be remembered as one of the toughest tests in the last decade. "Winning the Dakar is never easy – there are a lot of people trying. This year’s race was no exception, and brought a rollercoaster of emotions and results for the team." A day after De Villiers / Von Zitzewitz was relegated to a supporting role, Toyota's crew of Dutch driver Bernhard ten Brinke and his French navigator, Xavier Panseri suffered transmission failure in some of the biggest dunes on this year’s race, also consigning them to support vehicles for the eventual winners. Hall said: "In a sense, it was very comforting to have two water carriers supporting Nasser. But even so, I’d have preferred to have had them challenging for overall positions rather than stage wins." The South African driver, who has finished outside the Top 10 just once in the 15 previous Dakar Rallies he had raced in, continued, "But the organisers ran the final stage in reverse order, and the team decided that Dirk and I needed to wait for Nasser and Mathieu. So, we started the stage, but then pulled over and waited in the dunes. Luckily our crew had packed two deck chairs for us so we could watch a bit of racing in comfort." This ended up costing De Villiers / Von Zitzewit a place, finishing ninth overall in the standings. For Toyota Gazoo Racing SA, the win in Peru comes as the cherry on top of an amazing Dakar record. Hall said: "This is the one spot we needed. And it feels amazing to finally win."